Barcelona’s Gothic Quarter is one of the city's most charming neighborhoods. The area links the past with the present. Discover the charm of its streets, squares, hidden corners and hundred-year-old buildings with your skilled guide who will take you on a journey through the history of Barcelona. 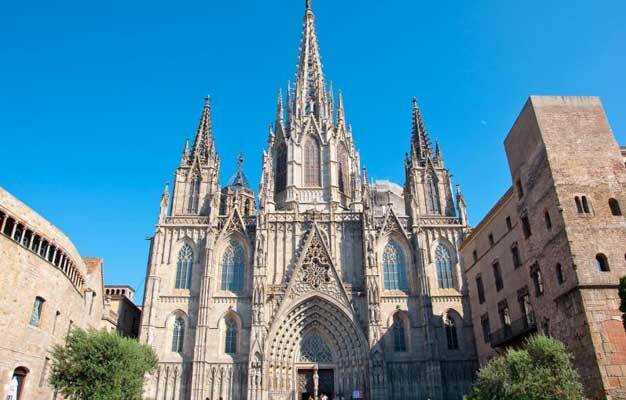 Explore Barcelona through the ages, from the past to the present. The Gothic Quarter is the oldest part of Barcelona with some of the landmarks dating back to Roman times. On this walking tour, you'll visit Barcelona's charming little squares, such as Plaça del Pi, Sant Felip Neri and Portal de Sant Iu. You will also visit August’s Temple, Cathedral Cloister and St. Agatha Chapel. The tour starts at Plaza Sant Jaume. The address will be clearly stated on your e-ticket. Please be there 15 minutes before the tour starts. The tour ends back at Plaza Sant Jaume. Yes, since the tour includes visits to churches you must cover your shoulders and you cannot wear shorts or sandals. No, but children under age 13 are free when accompanied by a paying adult. The tour departs daily at 9.30 AM in English. For other languages, please see the calendar above.